For all of Jamal Crawford’s intangibles , including the fact that Jimmy Butler wants him on the team, he is neither a terribly efficient player nor a very good defensive player. 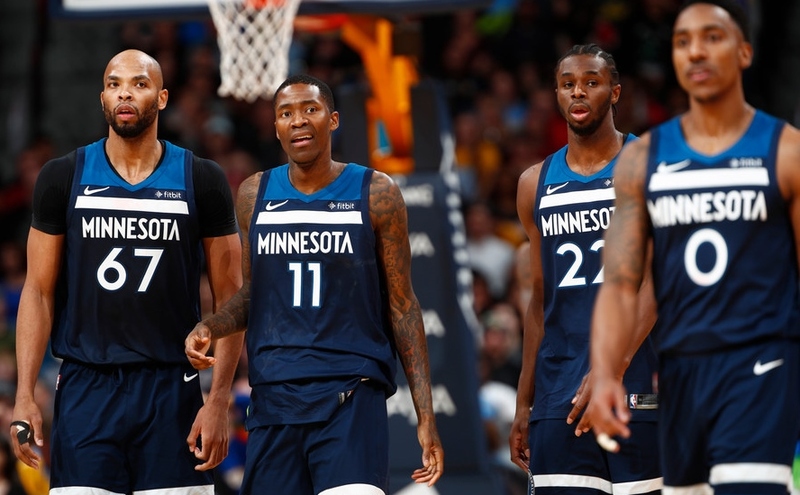 Jamal Crawford reportedly will decline his player option and become a free agent after one season with the Timberwolves. The 38-year-old veteran guard signed a two-year, $9 million last offseason and was pretty much as advertised for Minnesota this past year. He was a great guy to deal with, and I appreciated his candor while addressing social justice issues. He played fewer minutes than he was accustomed to (a shade over 20 per game, when his career average is a shade under 30, which might be part of why he is opting out) but when he did play he scored at a familiar rate: 17.9 points per 36 minutes last year, when his career average is 18. He was an excellent free-throw shooter and a willing three-point shooter. And Crawford was definitely the Wolves’ leader in shots that made fans say “Noooooo!” when he took them and “Yesssss!” when they went in. He was a good fit for the Wolves this season as they worked to establish credibility and leaned heavily on veterans. Advanced stats aside, I don’t think the Wolves would have made the playoffs without Crawford’s contributions. But … those advanced stats still tell a story that also leads me to this conclusion: If Crawford is, indeed, opting out of his contract and doesn’t end up signing a more lucrative deal here (a possibility, sure), it might be the best thing for both Crawford and the Wolves. For all of Crawford’s leadership, experience and other intangibles — notably among them that Jimmy Butler wants him on the team — he is neither a terribly efficient player nor a very good defensive player. He was dismally low in win shares per 48 minutes (0.37, when 1 is average) and had a negative value above replacement player. Both figures represented a decline over previous years. In short, he’s not really the kind of bench wing that thrives in the modern NBA. The best NBA benches now are stocked with guys who shoot a higher percentage from three-point range than Crawford (33.1 percent last year), play lock-down defense or — ideally — do both as a classic new “three-and-D” wing. Another year of Crawford on what, by NBA standards, is a modest contract would not have been the worst thing. But he’s probably suited for an even smaller role than the one he had with the Wolves last season. Maybe this is the best thing for both parties. Maybe Crawford can find a team willing to give him more than 20 minutes per game, and maybe the Wolves can find someone more effective and efficient as the first wing off the bench to keep taking steps forward. Souhan: Is Crawford's decision a bad omen for the Wolves?